Dcman wrote: Thanks DM, will let you know onboard. Just a quick question, must every member of the team play flight1A? Have a team member who is considering playing flight1B so just checking if that is permitted. Also, what happens if a member of the team busts and re-enters (either in flight1A or 1B)? Is he still eligible for the team last longer if for example he goes on to win it after re-entry. Do clarify that. Thank you for bringing up this matter DCman. In the event of any team member get busted, he/she can still reenter for Flight 1B but he/she is not allowed to take part in this Solo/Team Endurance Challenge anymore. One thing to take note is that there will not be any reentry for Flight 1A. All the teams have to fill up a form and submit all their member names at the registration counter by the end of 4th level of Flight 1A. May I know if there will be dealers chips this time? If so, how much would it be? Just want a more transparent format so that all players are able to forecast their expenditure properly.. There will be an optional of dealer chips at a cost of $20 as mentioned by pokerace. Added valkyri3 to solo endurance challenge. basically last team standing wins for the team endurance challenge? verysinister wrote: basically last team standing wins for the team endurance challenge? Any team member last the longest win the team endurance challenge! Let all of us make this event successful!!! 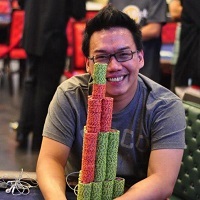 Added Calvin Ong from 1 place restaurant for Solo Endurance Challenge. I read that busted players can re-enter, but every else it is noted that this is a freezeout? vicyafos wrote: I read that busted players can re-enter, but every else it is noted that this is a freezeout? The Main Event is definitely a freezeout format. Under normal circumstances, busted players in flight 1A can only re-enter for Flight 1B. They cannot play Flight 1A anymore and thus will have to wait till registration open for Flight 1B and register as a new player. Nevertheless, for this solo/Team Endurance Challenge, once you are busted you can't join again. Added angandy for Solo Eudurance Challenge. Let's do this again. Instead of individual last longer win for the team. Should do overall team performance.